Story of Vampr: What does your brand’s name Stands for? What is the story behind Vampr and how was it born? To ‘vamp’ in music is to repeat or build on a looped groove, usually in a group improvisation scenario or with other players. We wanted a name that both communicated our core principle of encouraging connection and collaboration amongst musicians and music lovers, and something that sounded modern and didn’t sound particularly kitsch. Our motto is Play Together. We’ve got an incredibly able team, head up by co-founders Barry Palmer, as COO and myself as CEO. Barry Palmer is also the co-founder of the mobile apps SoundHalo and Kombie, and an experienced entrepreneur with companies turning over in excess of $40m/annum. He is also the guitarist and songwriter for seminal Australian band “Hunters & Collectors” who toured internationally for 17 years and sold 12x Platinum in their home country. In addition to Vampr I am also the director of indie record label RIPE, charged with marketing album and single releases internationally. 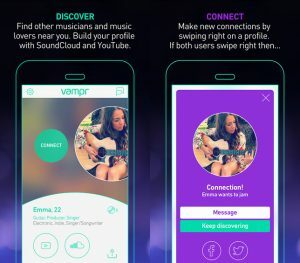 A songwriter and lead singer of Australian band Buchanan, with multi-million streams to its name and international touring experience, I am proud to say that Vampr is an app made by musicians, for musicians. Vampr will continue to expand it’s functionality for musicians and music lovers alike to deliver the richest possible forms of collaboration possible in an app environment. We have something exciting features on the horizon and other verticals we plan to pursue in due course. Get your hands dirty and waste no time. Starting any company is hard work, a constant learning curve, and you need to be able to consistently swallow healthy doses of humble pie if you are to get the best result for your company and from your team. There is no place for stubbornness in a startup when it comes to product or budget – being agile is as important as your initial vision.